Joe Motzko has registered four points in the eight games he played with the Capitals this season. Bouncing around has been a lot easier for new Chicago Wolves forward Joe Motzko the past year, because every place he's landed has been pretty good. Motzko, 27, was traded from Syracuse to Portland last season. That paid off at the end of the year, when he was called up to the Anaheim Ducks, played in a Stanley Cup Final game and got his name on the Cup. He signed with Washington as a free-agent last summer and was leading a strong Hershey squad with 48 points. Then, he was swapped for Alexandre Giroux at the trade deadline, joining a Wolves team that again is a top contender for a Calder Cup. Motzko has an ideal set of running mates with the Wolves. He's great on the power play and a dangerous open-ice creator, dishing out five assists in his first three games with Chicago. The under-the-radar expectations of playing on the second line for the talent-rich Wolves allow him to skate even more freely. The Wolves shouldn't have any complaints, either. It's always good to add a player who knows how to score. It's even better to pick up a player who finally is learning how to win. Koci a headliner -- Maybe Norfolk forward David Koci should work on commission. From the time his loan from the Chicago Blackhawks organization to the Admirals was announced, Norfolk had sold 150-plus extra tickets for his first home game, which will be Friday. It will be as much of a welcome-back party as anything. 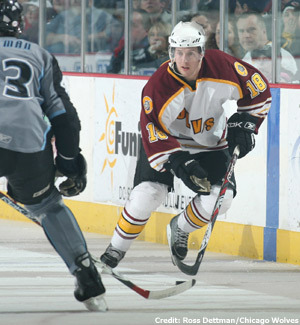 Koci, a wildly popular enforcer, played with Norfolk last season, when the club was affiliated with Chicago. The Blackhawks moved to Rockford this season, taking the 6-foot-6 Koci with them. He was returned to his old team Feb. 28. There is the shade of a downside to Koci's return to Norfolk, which now is affiliated with Tampa Bay. Koci had started to make in-roads with Chicago, skating in 18 games with the parent club this season. Less is more for Pogge -- Toronto Marlies goalie Justin Pogge has been watching game video this season and realizing that he hasn't been doing all that much. Except accomplishing a lot more. Pogge is one of the most improved players in the AHL, which is saying something considering how much is expected of him. He's cut his goals-against average from 3.03 as a rookie last season to 2.26 this year, and boosted his save percentage from .896 to .911. At 6-foot-3 and 190 pounds, Pogge is built like a power forward that could crush people across the ice. Such aggressiveness can be the bane of goalies, though. The film reveals Pogge is a lot calmer this season, moving around much less and playing a more conservative and effective style. That allows him to zone in on Xs and Os. Toronto coach Greg Gilbert has noticed Pogge is a lot better at reading the forecheck and at setting up the puck for his defensemen. It all adds up to consistency – Pogge has yet to lose back-to-back starts this season and is 21-6-4. Larger than life --Manitoba coach Scott Arniel has become a big man around Winnipeg. Maybe a little too big for his liking. As part of the team's latest marketing push, Arniel is the featured – and huge – face on several billboards in town. Arniel told the newspaper feedback from the recognition has come from all quarters. AHL Notes -- Philadelphia was victimized by some of its former players last weekend. Niko Dimitrakos scored the game-winning shootout goal for Binghamton on Feb. 29, and, on Sunday, Kiel McLeod and Marc Cavosie assisted on the game-tying and game-winning goals, respectively, for the Albany River Rats. That contest marked the first time this season Philadelphia had lost when leading after two periods. ... Four of Iowa goalie Tobias Stephan's five wins in February came via shutout. … Syracuse backup goalie Karl Goehring sat on the bench from Feb. 1-23. He then started five straight, going 4-0-0-1 and stopping 152 of 157 shots for a .968 save percentage. In the one shootout loss, to Wilkes-Barre/Scranton, he denied seven of nine shootout attempts and also stopped a penalty shot earlier in the game. ... In four games last week, the Syracuse Crunch scored a total of 10 goals, by eight different scorers. Syracuse had 13 different players register at least a point, including Goehring, against Toronto on Feb. 29. … Chicago defenseman Brian Sipotz dyed his hair blue last week, following through on a promise to fans to raise money for charity. Wolves fans had four weeks to donate funds in support of their favorite color, with blue ultimately garnering the most cash. Sipotz raised more than $2,000. ... Quad City set an AHL record by participating in its 17th shootout of the season, on March 1 in Manitoba. … In honor of National Procrastination Week, Grand Rapids made a last-minute offer to fans who put off going to Van Andel Arena to see Darren McCarty play for the Griffins. With Wednesday's contest against Toronto expected to be McCarty's final home game, the Griffins offered free admission to all such procrastinators. The catch? They had to wait until the second intermission to enter the arena.